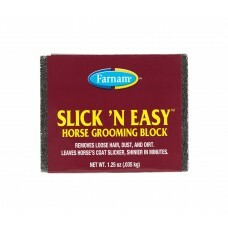 Slick 'N Easy™ is the best secret weapon to achieving a slicker coat. Transform your horse's coat in minutes by instantly removing dirt, dust and hair, and bringing out the shine. 1. Remove wrapper and hold Slick' N Easy by one of its long edges. 2. Scrape the horse's coat vigorously, in short rapid strokes, with the other long edge. Scrape in the same direction as the hair grows. 3. 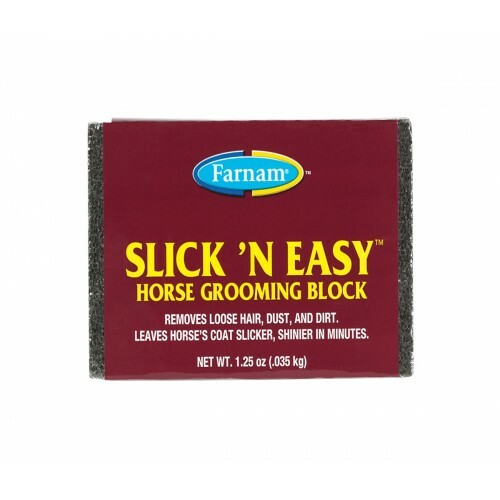 After several uses, your Slick 'N Easy Grooming Block will develop rounded edges. 4. To restore to a sharp edge, rub the long edge on concrete (flat sidewalk, block wall) or any similar abrasive surface.